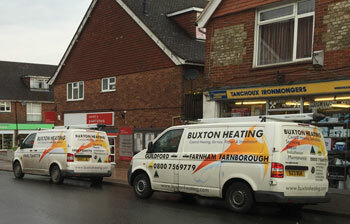 Although usually associated with Surrey because of our proximity to Haslemere, Buxton Heating is actually based in Grayshott, Hampshire. The intersection of the three counties is just a couple of miles away from the office. Hampshire is a huge county extending from Portsmouth and Southampton on the South Coast to Farnborough and Fleet at its northern point. With such a large county it is inevitable that there is a great diversity in our work. We don’t however cover the whole county because of its scale. Farnborough is famous for its aviation links and engineering industry. We naturally have a large number of commercial heating clients in this area and also extending down to Basingstoke, but not much further. The domestic heating customers we have in the county are again a mix of urban, mains gas boilers and central heating systems, through to LPG systems and oil-fired boilers that are used in the rural, non-mains gas areas. Given our location in Hampshire we have many clients in the county, especially Liphook, Alton and Bordon / Whitehill areas. Hampshire, abbreviated ‘Hants’. The official county town of Hampshire is Winchester, which was the former capital city of England. Hampshire is the most populous ceremonial county in the United Kingdom, with the larger South Hampshire metropolitan area having a population of 1,547,000. Hampshire is notable for housing the birthplaces of the Royal Navy, British Army, and Royal Air Force. It neighbours Dorset to the west, Wiltshire to the northwest, Berkshire to the north, Surrey to the north-east, and West Sussex to the east. Hampshire’s attractions for tourism include various seaside resorts and two national parks: the New Forest and the South Downs (which together cover 45% of the county). Hampshire has a long maritime history and two of the largest ports in Europe, which are Portsmouth and Southampton. The county is also famous for being home to such writers as Jane Austen and Charles Dickens.